Their distant relationship to the elephant goes some way to explaining the dugongs’ large and thick-skinned bodies, which grow up to three metres in length and weigh more than 600 kilograms at maturity. 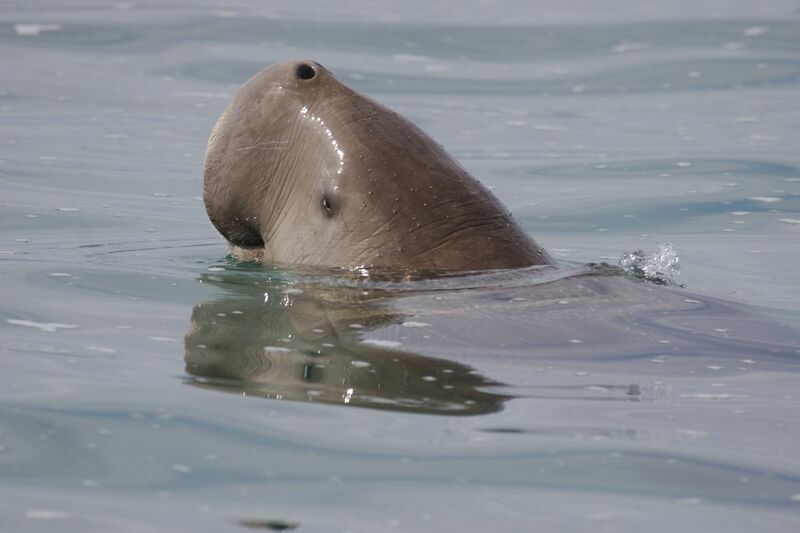 In the warmer waters of the bay dugongs grow slowly and tend to be a larger size than those found elsewhere. Dugong bones are dense and solid with no marrow, acting as ballast and enabling the dugong to stay suspended just below the surface of the water. Their bodies are streamlined, fast when swimming over short distances propelled by a dolphin like tail, and fully adapted to a marine pelagic lifestyle. They can manage six minutes without breathing but generally surface every two-and-a-half. They have been known to travel 20 kilometres from shore and dive to depths of 20 metres. Dugongs have poor vision but acute hearing and communicate with one another by chirps, whistles and barks. Tusks are present in males and some older females, and all dugongs have scars on their skin, males from warding off other males, and females from mating. Dugongs feed on a species of low fibre seagrass in both shallow and deep water, eating up to 30kg per day and leaving long, visible trails in the grass in their wake. They cannot digest high fibre seagrass and their preferred type is prolific only in the eastern parts of Moreton Bay, making it an ideal habitat for the mammal. When in muddy waters, dugongs feel for the plants with sensitive hairs near their lips, and use their flexible muscular upper lip to dig up the plants. During winter months in the bay, when less seagrass is available, protein in their diet is supplemented by eating small amounts of sea squirts and marine worms. Being slow breeders, dugongs are susceptible to a decline in population numbers. It takes 10 to 17 years for a female dugong to reach breeding maturity, after which she will give birth to one calf every five to seven years. Historically, the Indigenous people of the bay hunted dugongs for their meat, skin and bones. After European settlement dugongs were harvested in much larger numbers for their blubber. Janet Lanyon, researcher at the Marine Biological Sciences Department at the University of Queensland, says the most serious threat to dugongs today is loss of seagrass habitat. The major flooding events of recent years destroyed extensive seagrass meadows. Human recreation has also had an impact, with boat strikes and entanglement in fishing nets causing dugong fatalities. Traditional boat moorings also destroy large circular tracts of sea grass. According to Ms Lanyon, there are things we can do to help reduce our impact on dugongs. 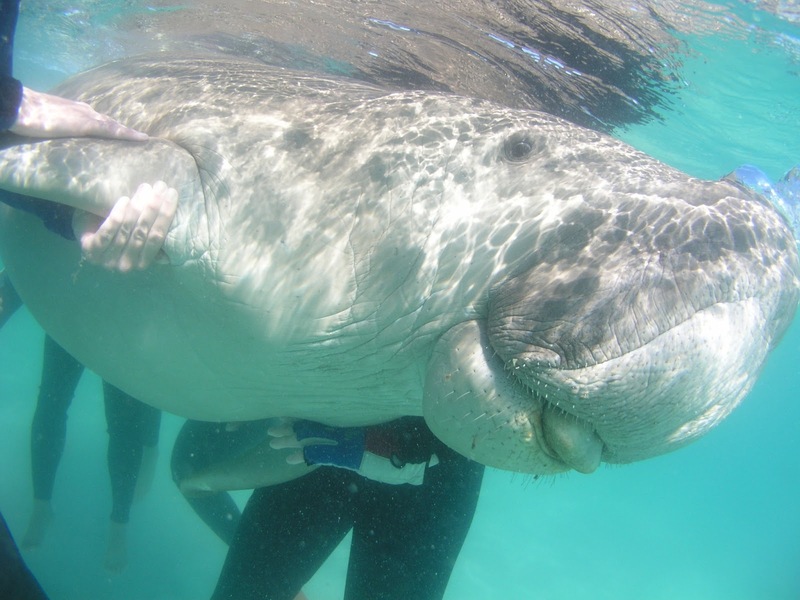 Research being done by the UQ Dugong Group has identified that during winter months, most of the dugongs spend time in the Rous Channel, between North Stradbroke Island and Moreton Island, where they can easily move back and forth between the bay and the warmer waters of the ocean. At low tide there are dugong groups near the surface in waters adjacent to the banks, where they like to drift gently with the tide. During April to August extreme care should be taken when driving boats in this region, as there could be 50 to 100 dugongs in the channel at any time. It is best to have a spotter in the front of the boat, always follow the “go slow” instructions, and travel at a non-planing speed. Stick to the channels and drive slowly and carefully across the sea banks. If possible, use propeller guards on your boat to reduce striking dugongs. Slow driving also reduces sedimentation, which smothers seagrass.The UQ dugong team continues to observe and research the mammals to better understand their habits and threats. To date, they have caught and tagged more than 600 dugongs in Moreton Bay using a rodeo technique, holding the dugong at the surface for five minutes while measurements, samples and photos are taken. They are then tagged and micro-chipped so that their health and movements can be monitored. Sincere thanks to Janet Lanyon and researchers at the Marine Biological Sciences Department at UQ for their assistance and photographs. Published on the cover wrap of the current edition of Straddie Island News now on sale at newsagents and shops on Stradbroke.